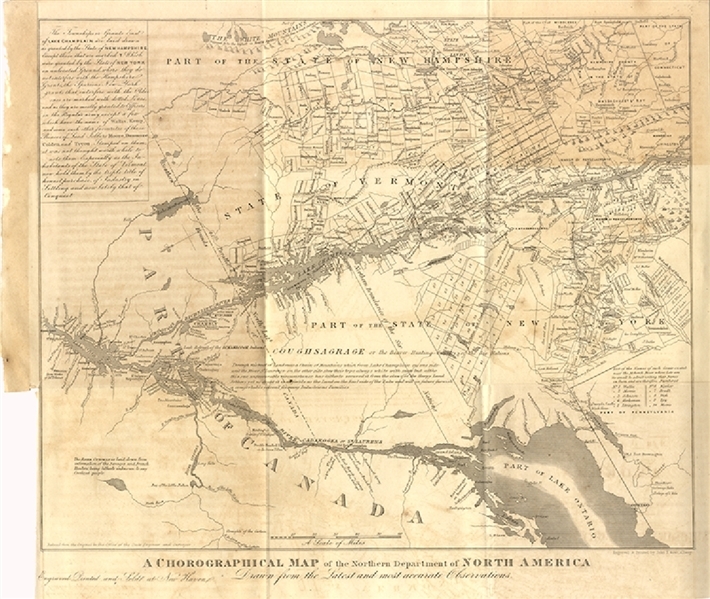 Map, 13” x 12, “A Chorographical Map of the Northern Department of North-America, Drawn from the Latest and most accurate Observations.” artographic rarity of the highest importance, Bernard Romans’ Chorographical Map is the first great map with Vermont as its focus. It is the first map to use the term “State of Vermont” and was created in part to support the positions of Vermont and New Hampshire in their long-running territorial dispute with New York. Oriented with east at the top of the map, the coverage includes all of the “State of Vermont” (the first time this name appears on a printed map), along with the western portions of Connecticut, Massachusetts and New Hampshire, eastern New York including part of Lake Ontario, a corner of Pennsylvania, and the upper St. Lawrence and part of Quebec. Major lakes, rivers, and streams are shown, as is a minimal amount of topographical information. The boundaries of dozens of townships in New York, New Hampshire and Vermont, as well as hundreds of land grants in the Lake Champlain, Hudson and Mohawk valleys dominate the map. A later printing published by John E. Gavit, Albany, c1850, disbound, VG.